Myocardial infarction (MI) (ie, heart attack) is the irreversible death (necrosis) of heart muscle secondary to prolonged lack of oxygen supply (ischemia). Approximately 1.5 million cases of MI occur annually in the United States. See the images below. The ECG is the most important tool in the initial evaluation and triage of patients in whom an acute coronary syndrome (ACS), such as MI, is suspected. It is confirmatory of the diagnosis in approximately 80% of cases. For individuals with highly probable or confirmed acute MI, coronary angiography can be used to definitively diagnose or rule out coronary artery disease. Initial stabilization of patients with suspected MI and ongoing acute chest pain should include administration of sublingual nitroglycerin if patients have no contraindications to it. Although patients presenting without ST-segment elevation (non-STE-ACS) are not candidates for immediate administration of thrombolytic agents, they should receive anti-ischemic therapy and may be candidates for PCI urgently or during admission. 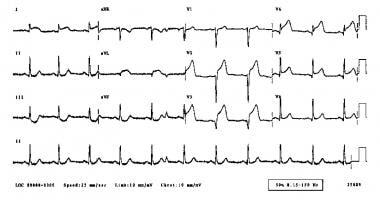 The electrocardiographic (ECG) results of an acute MI are seen below. MI is considered part of a spectrum referred to as acute coronary syndrome (ACS). The ACS continuum representing ongoing myocardial ischemia or injury consists of unstable angina, non–ST-segment elevation MI (NSTEMI)—collectively referred to as non–ST-segment acute coronary syndrome (NSTE ACS)—and ST-segment elevation MI (STEMI). Patients with ischemic discomfort may or may not have ST-segment or T-wave changes denoted on the electrocardiogram (ECG). 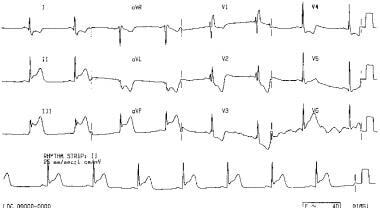 ST elevations seen on the ECG reflect active and ongoing transmural myocardial injury. Without immediate reperfusion therapy, most patients with STEMI develop Q waves, reflecting a dead zone of myocardium that has undergone irreversible damage and death. Those without ST elevations are diagnosed either with unstable angina or NSTEMI―differentiated by the presence of cardiac enzymes. Both these conditions may or may not have changes on the surface ECG, including ST-segment depressions or T-wave morphological changes. MI may lead to impairment of systolic or diastolic function and to increased predisposition to arrhythmias and other long-term complications. Evidence suggests a benefit from the use of beta-blockers, angiotensin-converting enzyme (ACE) inhibitors, angiotensin II receptor blockers, and statins. Myocardial infarction (MI), commonly known as a heart attack, is defined pathologically as the irreversible death of myocardial cells caused by ischemia. Clinically, MI is a syndrome that can be recognized by a set of symptoms, chest pain being the hallmark of these symptoms in most cases, supported by biochemical laboratory changes, electrocardiographic (ECG) changes, or findings on imaging modalities able to detect myocardial injury and necrosis. 2. Cardiac death with symptoms suggestive of myocardial ischemia and presumed new ischemic changes or injury or new BBB on ECG, but death occurred before cardiac biomarker levles were obtained, or before cardiac biomarker values would be increased. Type 1 (spontaneous MI): Related to atherosclerotic plaque rupture, ulceration, fissuring, erosion, or dissection with intraluminal thrombus in one or more of the coronary arteries, leading to decreased myocardial blood flow or distal platelet emboli and thereby resulting in myocyte necrosis. The patient may or may not have underlying obstructive coronary artery disease (CAD). Type 2 (MI secondary to an ischemic imbalance): MI consequent to increased oxygen demand or a decreased supply (eg, coronary endothelial dysfunction, coronary artery spasm, coronary artery embolus, tachyarryhthmias/bradyarrhythmias, anemia, respiratory failure, hypertension, or hypotension). Type 3 (MI resulting in death when biomarker values are unavailable): Sudden, unexpected cardiac death before blood samples for biomarkers could be drawn or before their appearance in the circulation. Type 4a (MI related to percutaneous coronary intervention [PCI]): Elevation of biomarker values (cTn is preferred) to more than 5 times the 99 th percentile of the URL in patients with normal baseline values (< 99 th percentile URL) or a rise of values over 20% if the baseline values are elevated but stable or falling. In addition, any of the following are required: (1) symptoms suggestive of myocardial ischemia; (2) new ischemic ECG changes or new BBB; (3) angiographic loss of patency of a major coronary artery or a side branch or persistent slow flow or no flow or embolization; or (4) demonstration of the new loss of viable myocardium or new regional wall motion abnormality by cardiac imaging. Type 4b (MI related to stent thrombosis): MI associated with stent thrombosis as detected by coronary angiography or autopsy in the setting of myocardial ischemia in combination with a rise and/or fall of cardiac biomarkers with at least one value above the 99 th percentile URL. Type 5 (MI related to coronary artery bypass grafting [CABG]): Elevation of cardiac biomarker values more than 10 times the 99 th percentile URL in patients with normal baseline cTn values. In addition, either (1) new pathologic Q waves or new BBB, (2) angiographic-documented new graft or native coronary artery occlusion, or (3) evidence of new loss of viable myocardium or new regional wall motion abnormality by cardiac imaging is required. The term "acute coronary syndrome" (ACS) refers to a spectrum of conditions that occur due to acute myocardial ischemia and/or infarction as a result of an abrupt reduction in blood flow through the coronary artery circulation. For the normal heart to continue to function and to steadily pump blood efficiently to meet the demands of the body, it needs to have a constant supply of oxygen and nutrients provided mainly by the coronary circulation. A condition called myocardial ischemia happens if blood supply to the myocardium does not meet the demand. If this imbalance persists, it triggers a cascade of cellular, inflammatory and biochemical events, leading eventually to the irreversible death of heart muscle cells, resulting in MI. In some occasions, restoration of blood flow to the damaged myocardium triggers further ischemic cellular damage, this paradoxical effect is known as reperfusion injury. This process involves a complex interaction between oxygen free radicals and intracellular calcium, leading to acceleration of myocardial damage and death, microvascular dysfunction and fatal arrhythmias. The role of nitric oxide (an endothelium-derived relaxing factor) as a cardioprotective agent against reperfusion injury, has been demonstrated, as nitric oxide works to inactivate oxygen free radicals, therefore, ameliorating the process of reperfusion injury. Despite the improved understanding of the process of reperfusion injury, there are no specific therapies to prevent it. Stunned myocardium is a condition of transient left ventricular dysfunction following an ischemic event to the myocardium. It occurs if coronary blood flow was impaired for a brief period of time (5 to 15 minutes). Usually, stunned myocardium persists for hours or days following the re-establishment of coronary blood flow. However, prolonged exposure of the myocardium to an ischemic state, results in an impairment of its contractile function, which can be partial or complete, this is known as myocardial hibernation, and is reversible with revascularization. The process of acute coronary thrombosis leading to ACS involves the pathogenic mechanism of plaque rupture, and less frequently plaque erosion. The Brasilia Heart Study Group indicates that changes in high-density lipoprotein (HDL) during an MI may alter the antiatherogenic function of HDL to transport lipids from arterial walls. The investigators noted a simultaneous decrease in lipid transfer to HDL and in the capacity of HDL to efflux cholesterol from cells occurs in the acute period after an MI. Atherosclerosis is the disease primarily responsible for most acute coronary syndrome (ACS) cases. Approximately 90% of myocardial infarctions (MIs) result from an acute thrombus that obstructs an atherosclerotic coronary artery. Plaque rupture and erosion are considered to be the major triggers for coronary thrombosis. Following plaque erosion or rupture, platelet activation and aggregation, coagulation pathway activation, and endothelial vasoconstriction occur, leading to coronary thrombosis and occlusion. Within the coronary vasculature, flow dynamics and endothelial shear stress are implicated in the pathogenesis of vulnerable plaque formation. A large body of evidence indicates that in numerous cases, culprit lesions are stenoses of less than 70% and are located proximally within the coronary tree. [19, 20] Coronary atherosclerosis is especially prominent near branching points of vessels. Culprit lesions that are particularly prone to rupture are atheromas containing abundant macrophages, a large lipid-rich core surrounded by a thinned fibrous cap. In addition, MI can result from hypoxia due to carbon monoxide poisoning or acute pulmonary disorders. Although rare, pediatric coronary artery disease may be seen with Marfan syndrome, Kawasaki disease, Takayasu arteritis, progeria, and cystic medial necrosis. Coronary artery disease (CAD) is the leading cause of death in the United States; approximately 500,000-700,000 deaths related to CAD occur each year, making it the cause of death in an estimated one third of all deaths in the population for those older than 35 years. CAD is also the number one cause of death in European countries. It is believed that these international trends in the incidence of CAD and subsequent acute MI are largely related to consequences of social and economic changes in these countries, resulting in better healthcare access and increases in life expectancy, in addition to adoption of westernized diets, reduction in physical activity, and higher rates of smoking. Acute myocardial infarction (MI) is associated with a 30% mortality rate; about 50% of the deaths occur prior to arrival at the hospital. An additional 5-10% of survivors die within the first year after their myocardial infarction. Approximately half of all patients with an MI are rehospitalized within 1 year of their index event. Overall, prognosis is highly variable and depends largely on the extent of the infarct, the residual left ventricular function, and whether the patient underwent revascularization. It has been shown that five baseline parameters at presentation of patients with acute MI account for over 90% of the prognostic predictors of 30-day mortality from acute MI. These parameters include age, systolic blood pressure on presentation, Killip classification, heart rate, and anatomic location of the MI. Killip class IV describes individuals in cardiogenic shock or hypotension (measured as systolic blood pressure < 90 mmHg), and evidence of low cardiac output (oliguria, cyanosis, or impaired mental status). Patients with active symptoms of acute coronary syndrome (ACS) should be instructed to call emergency services (eg, 911 in the United States), and they should be transported by emergency medical services personnel, not by themselves, family, or friends. Patients should be instructed to go to the emergency department immediately if the suspected ACS symptoms last longer than 20 minutes at rest or are associated with near syncope/syncope or hemodynamic instability. All patients should be educated regarding the critical role of smoking in the development of CAD. Smoking cessation classes should be offered to help patients avoid smoking after their MI. For patient education resources, see the Heart Health Center and Cholesterol Center, as well as High Cholesterol, Cholesterol Charts (What the Numbers Mean), Lifestyle Cholesterol Management, Chest Pain, Coronary Heart Disease, Heart Attack, Angina Pectoris, Cholesterol-Lowering Medications, and Statins for Cholesterol. [Guideline] O'Gara PT, Kushner FG, Ascheim DD, et al. American College of Cardiology Foundation/American Heart Association Task Force on Practice Guidelines. 2013 ACCF/AHA guideline for the management of ST-elevation myocardial infarction: a report of the American College of Cardiology Foundation/American Heart Association Task Force on Practice Guidelines. Circulation. 2013 Jan 29. 127 (4):e362-425. [Medline]. [Full Text]. [Guideline] Task Force on the management of ST-segment elevation acute myocardial infarction of the European Society of Cardiology (ESC); Steg PG, James SK, Atar D, et al. ESC Guidelines for the management of acute myocardial infarction in patients presenting with ST-segment elevation. Eur Heart J. 2012 Oct. 33 (20):2569-619. [Medline]. [Full Text]. Costa e Silva R, Pellanda L, Portal V, Maciel P, Furquim A, Schaan B. Transdisciplinary approach to the follow-up of patients after myocardial infarction. Clinics (Sao Paulo). 2008 Aug. 63 (4):489-96. [Medline]. Rathore SS, Gersh BJ, Weinfurt KP, Oetgen WJ, Schulman KA, Solomon AJ. The role of reperfusion therapy in paced patients with acute myocardial infarction. Am Heart J. 2001 Sep. 142(3):516-9. [Medline]. Jaffe AS. Third universal definition of myocardial infarction. Clin Biochem. 2013 Jan. 46 (1-2):1-4. [Medline]. Bonaca MP, Wiviott SD, Braunwald E, et al. American College of Cardiology/American Heart Association/European Society of Cardiology/World Heart Federation Universal definition of myocardial infarction classification system and the risk of cardiovascular death: observations from the TRITON-TIMI 38 Trial (Trial to Assess Improvement in Therapeutic Outcomes by Optimizing Platelet Inhibition With Prasugrel-Thrombolysis in Myocardial Infarction 38). Circulation. 2012 Jan 31. 125(4):577-83. [Medline]. Thygesen K, Alpert JS, Jaffe AS, et al. Third universal definition of myocardial infarction. J Am Coll Cardiol. 2012 Oct 16. 60 (16):1581-98. [Medline]. Fujita M, Nakae I, Kihara Y, et al. Determinants of collateral development in patients with acute myocardial infarction. Clin Cardiol. 1999 Sep. 22 (9):595-9. [Medline]. Burchfield JS, Xie M, Hill JA. Pathological ventricular remodeling: mechanisms: part 1 of 2. Circulation. 2013 Jul 23. 128 (4):388-400. [Medline]. Yellon DM, Hausenloy DJ. Myocardial reperfusion injury. N Engl J Med. 2007 Sep 13. 357 (11):1121-35. [Medline]. Marban E. Myocardial stunning and hibernation. The physiology behind the colloquialisms. Circulation. 1991 Feb. 83 (2):681-8. [Medline]. McGill HC Jr, McMahan CA, Zieske AW, et al. Associations of coronary heart disease risk factors with the intermediate lesion of atherosclerosis in youth. The Pathobiological Determinants of Atherosclerosis in Youth (PDAY) Research Group. Arterioscler Thromb Vasc Biol. 2000 Aug. 20 (8):1998-2004. [Medline]. Kolodgie FD, Virmani R, Burke AP, et al. Pathologic assessment of the vulnerable human coronary plaque. Heart. 2004 Dec. 90 (12):1385-91. [Medline]. Soares AAS, Tavoni TM, de Faria EC, Remalay AT, Maranhao RC, Sposito AC, et al. HDL acceptor capacities for cholesterol efflux from macrophages and lipid transfer are both acutely reduced after myocardial infarction. Clin Chim Acta. 2018 Mar. 478:51-6. [Medline]. Holmes MV, Millwood IY, Kartsonaki C, et al, for the China Kadoorie Biobank Collaborative Group. Lipids, lipoproteins, and metabolites and risk of myocardial infarction and stroke. J Am Coll Cardiol. 2018 Feb 13. 71 (6):620-32. [Medline]. [Full Text]. Chatzizisis YS, Coskun AU, Jonas M, Edelman ER, Feldman CL, Stone PH. Role of endothelial shear stress in the natural history of coronary atherosclerosis and vascular remodeling: molecular, cellular, and vascular behavior. J Am Coll Cardiol. 2007 Jun 26. 49(25):2379-93. [Medline]. Wang JC, Normand SL, Mauri L, Kuntz RE. Coronary artery spatial distribution of acute myocardial infarction occlusions. Circulation. 2004 Jul 20. 110(3):278-84. [Medline]. Falk E, Shah PK, Fuster V. Coronary plaque disruption. Circulation. 1995 Aug 1. 92(3):657-71. [Medline]. McDaniel MC, Willis P, Walker B, et al. Plaque necrotic core content is greater immediately distal to bifurcations compared to bifurcations in the proximal lad of patients with CAD. Am J Cardiol. 2008. 102(8):242i. Yusuf S, Hawken S, Ounpuu S, et al, for the INTERHEART Study Investigators. Effect of potentially modifiable risk factors associated with myocardial infarction in 52 countries (the INTERHEART study): case-control study. Lancet. 2004 Sep 11-17. 364 (9438):937-52. [Medline]. Macintyre CR, Heywood AE, Kovoor P, et al. Ischaemic heart disease, influenza and influenza vaccination: a prospective case control study. Heart. 2013 Dec. 99 (24):1843-8. [Medline]. Kwong JC, Schwartz KL, Campitelli MA, et al. Acute myocardial infarction after laboratory-confirmed influenza infection. N Engl J Med. 2018 Jan 25. 378 (4):345-53. [Medline]. [Full Text]. Rogers WJ, Frederick PD, Stoehr E, et al. Trends in presenting characteristics and hospital mortality among patients with ST elevation and non-ST elevation myocardial infarction in the National Registry of Myocardial Infarction from 1990 to 2006. Am Heart J. 2008 Dec. 156 (6):1026-34. [Medline]. Levi F, Lucchini F, Negri E, La Vecchia C. Trends in mortality from cardiovascular and cerebrovascular diseases in Europe and other areas of the world. Heart. 2002 Aug. 88 (2):119-24. [Medline]. Critchley J, Liu J, Zhao D, Wei W, Capewell S. Explaining the increase in coronary heart disease mortality in Beijing between 1984 and 1999. Circulation. 2004 Sep 7. 110 (10):1236-44. [Medline]. Reddy KS. Cardiovascular disease in non-Western countries. N Engl J Med. 2004 Jun 10. 350 (24):2438-40. [Medline]. Okrainec K, Banerjee DK, Eisenberg MJ. Coronary artery disease in the developing world. Am Heart J. 2004 Jul. 148 (1):7-15. [Medline]. Ezzati M. How can cross-country research on health risks strengthen interventions? Lessons from INTERHEART. Lancet. 2004 Sep 11-17. 364 (9438):912-4. [Medline]. Antman EM, Cohen M, Bernink PJ, McCabe CH, Horacek T, Papuchis G. The TIMI risk score for unstable angina/non-ST elevation MI: A method for prognostication and therapeutic decision making. JAMA. 2000 Aug 16. 284(7):835-42. [Medline]. Jaber WA, Prior DL, Marso SP, Houghtaling PL, Menon V, Harrington RA. CHF on presentation is associated with markedly worse outcomes among patients with acute coronary syndromes: PURSUIT trial findings. Circulation 1999:100(suppl I):I-433 . Killip T 3rd, Kimball JT. Treatment of myocardial infarction in a coronary care unit. A two year experience with 250 patients. Am J Cardiol. 1967 Oct. 20(4):457-64. [Medline]. James SK, Lindahl B, Siegbahn A, et al. N-terminal pro-brain natriuretic peptide and other risk markers for the separate prediction of mortality and subsequent myocardial infarction in patients with unstable coronary artery disease: a Global Utilization of Strategies To Open occluded arteries (GUSTO)-IV substudy. Circulation. 2003 Jul 22. 108 (3):275-81. [Medline]. de Lemos JA, Morrow DA, Bentley JH, et al. The prognostic value of B-type natriuretic peptide in patients with acute coronary syndromes. N Engl J Med. 2001 Oct 4. 345 (14):1014-21. [Medline]. Haaf P, Reichlin T, Corson N, et al. B-type natriuretic peptide in the early diagnosis and risk stratification of acute chest pain. Am J Med. 2011 May. 124 (5):444-52. [Medline]. Morrow DA, Rifai N, Antman EM, et al. C-reactive protein is a potent predictor of mortality independently of and in combination with troponin T in acute coronary syndromes: a TIMI 11A substudy. Thrombolysis in Myocardial Infarction. J Am Coll Cardiol. 1998 Jun. 31 (7):1460-5. [Medline]. Boggs W. Worse Prognosis for Myocardial Infarction Patients With ST-Deviation in AVR. Medscape. Jul 11 2013. [Full Text]. Alherbish A, Westerhout CM, Fu Y, et al. The forgotten lead: does aVR ST-deviation add insight into the outcomes of ST-elevation myocardial infarction patients?. Am Heart J. Jul 3 2013. [Full Text]. Lee KL, Woodlief LH, Topol EJ, et al, for the GUSTO-I investigators. Predictors of 30-day mortality in the era of reperfusion for acute myocardial infarction. Results from an international trial of 41,021 patients. GUSTO-I Investigators. Circulation. 1995 Mar 15. 91 (6):1659-68. [Medline]. [Guideline] Smith SC Jr, Allen J, Blair SN, et al,. AHA/ACC guidelines for secondary prevention for patients with coronary and other atherosclerotic vascular disease: 2006 update: endorsed by the National Heart, Lung, and Blood Institute. Circulation. 2006 May 16. 113 (19):2363-72. [Medline]. [Full Text]. Mann DL, Zipes DP, Libby P, Bonow RO, Braunwald E, eds. Braunwald’s Heart Disease: A Textbook of Cardiovascular Medicine. 10th ed. Philadelphia, PA: Elsevier Saunders; 2015. Wijnbergen I, Van't Veer M, Pijls NH, Tijssen J. Circadian and weekly variation and the influence of environmental variables in acute myocardial infarction. Neth Heart J. 2012 Sep. 20 (9):354-9. [Medline]. Kundi H, Kiziltunc E, Korkmaz A, Cicek G, Ornek E, Ileri M. A novel risk scoring system to predict cardiovascular death in patients with acute myocardial infarction: CHA2DS2-VASc-CF score. Clin Appl Thromb Hemost. 2018 Mar. 24 (2):273-8. [Medline]. Kacprzak M, Kidawa M, Zielińska M. Fever in myocardial infarction: is it still common, is it still predictive?. Cardiol J. 2012. 19 (4):369-73. [Medline]. Risøe C, Kirkeby OJ, Grøttum P, Sederholm M, Kjekshus JK. Fever after acute myocardial infarction in patients treated with intravenous timolol or placebo. Br Heart J. 1987 Jan. 57 (1):28-31. [Medline]. Patel MR, Mahaffey KW, Armstrong PW, Weaver WD, Tasissa G, Hochman JS, et al. Prognostic usefulness of white blood cell count and temperature in acute myocardial infarction (from the CARDINAL Trial). Am J Cardiol. 2005 Mar 1. 95 (5):614-8. [Medline]. Lee-Lewandrowski E, Januzzi JL Jr, Grisson R, Mohammed AA, Lewandrowski G, Lewandrowski K. Evaluation of first-draw whole blood, point-of-care cardiac markers in the context of the universal definition of myocardial infarction: a comparison of a multimarker panel to troponin alone and to testing in the central laboratory. Arch Pathol Lab Med. 2011 Apr. 135 (4):459-63. [Medline]. Apple FS. A new season for cardiac troponin assays: it's time to keep a scorecard. Clin Chem. 2009 Jul. 55 (7):1303-6. [Medline]. Diercks DB, Peacock WF 4th, Hollander JE, et al. Diagnostic accuracy of a point-of-care troponin I assay for acute myocardial infarction within 3 hours after presentation in early presenters to the emergency department with chest pain. Am Heart J. 2012 Jan. 163 (1):74-80.e4. [Medline]. Takakuwa KM, Ou FS, Peterson ED, et al. The usage patterns of cardiac bedside markers employing point-of-care testing for troponin in non-ST-segment elevation acute coronary syndrome: results from CRUSADE. Clin Cardiol. 2009 Sep. 32 (9):498-505. [Medline]. Mueller C. Biomarkers and acute coronary syndromes: an update. Eur Heart J. 2014 Mar. 35 (9):552-6. [Medline]. Anderson JL, Adams CD, Antman EM, et al, for the ACC, AHA Task Force on Practice Guidelines (Writing Committee to Revise the 2002 Guidelines for the management of patients with unstable angina/NSTEMI, et al. ACC/AHA 2007 guidelines for the management of patients with unstable angina/non ST-elevation myocardial infarction: a report of the American College of Cardiology/American Heart Association Task Force on Practice Guidelines (Writing Committee to Revise the 2002 Guidelines for the Management of Patients With Unstable Angina/Non ST-Elevation Myocardial Infarction): developed in collaboration with the American College of Emergency Physicians, the Society for Cardiovascular Angiography and Interv... Circulation. 2007 Aug 14. 116 (7):e148-304. [Medline]. Reichlin T, Irfan A, Twerenbold R, et al. Utility of absolute and relative changes in cardiac troponin concentrations in the early diagnosis of acute myocardial infarction. Circulation. 2011 Jul 12. 124(2):136-45. [Medline]. Storrow AB, Nowak RM, Diercks DB, et al. Absolute and relative changes (delta) in troponin I for early diagnosis of myocardial infarction: Results of a prospective multicenter trial. Clin Biochem. 2015 Mar. 48 (4-5):260-7. [Medline]. Storrow AB, Christenson RH, Nowak RM, et al. Diagnostic performance of cardiac troponin I for early rule-in and rule-out of acute myocardial infarction: Results of a prospective multicenter trial. Clin Biochem. 2015 Mar. 48 (4-5):254-9. [Medline]. Cullen L, Parsonage WA, Greenslade J, et al. Delta troponin for the early diagnosis of AMI in emergency patients with chest pain. Int J Cardiol. 2013 Oct 3. 168 (3):2602-8. [Medline]. Thygesen K, Mair J, Mueller C, et al, for the Study Group on Biomarkers in Cardiology of the ESC Working Group on Acute Cardiac Care. Recommendations for the use of natriuretic peptides in acute cardiac care: a position statement from the Study Group on Biomarkers in Cardiology of the ESC Working Group on Acute Cardiac Care. Eur Heart J. 2012 Aug. 33 (16):2001-6. [Medline]. Goldstein JA, Chinnaiyan KM, Abidov A, et al, for the CT-STAT Investigators. The CT-STAT (Coronary Computed Tomographic Angiography for Systematic Triage of Acute Chest Pain Patients to Treatment) trial. J Am Coll Cardiol. 2011 Sep 27. 58 (14):1414-22. [Medline]. Samad Z, Hakeem A, Mahmood SS, et al. A meta-analysis and systematic review of computed tomography angiography as a diagnostic triage tool for patients with chest pain presenting to the emergency department. J Nucl Cardiol. 2012 Apr. 19 (2):364-76. [Medline]. Cremer PC, Khalaf S, Agarwal S, et al. Myocardial perfusion imaging in emergency department patients with negative cardiac biomarkers: yield for detecting ischemia, short-term events, and impact of downstream revascularization on mortality. Circ Cardiovasc Imaging. 2014 Nov. 7 (6):912-9. [Medline]. Amgen Inc. FDA approves Amgen's Repatha (evolocumab) to prevent heart attack and stroke [press release]. Available at https://www.amgen.com/media/news-releases/2017/12/fda-approves-amgens-repatha-evolocumab-to-prevent-heart-attack-and-stroke/. December 1, 2017; Accessed: December 7, 2017. Sabatine MS, Giugliano RP, Keech AC, et al, for the FOURIER Steering Committee and Investigators. Evolocumab and clinical outcomes in patients with cardiovascular disease. N Engl J Med. 2017 May 4. 376 (18):1713-22. [Medline]. [Full Text]. Becker L, Larsen MP, Eisenberg MS. Incidence of cardiac arrest during self-transport for chest pain. Ann Emerg Med. 1996 Dec. 28 (6):612-6. [Medline]. Mathews R, Peterson ED, Li S, et al. Use of emergency medical service transport among patients with ST-segment-elevation myocardial infarction: findings from the National Cardiovascular Data Registry Acute Coronary Treatment Intervention Outcomes Network Registry-Get With The Guidelines. Circulation. 2011 Jul 12. 124 (2):154-63. [Medline]. [Guideline] Jneid H, Addison D, Bhatt DL, et al. 2017 AHA/ACC clinical performance and quality measures for adults with ST-elevation and non-ST-elevation myocardial infarction: a report of the American College of Cardiology/American Heart Association Task Force on Performance Measures. J Am Coll Cardiol. 2017 Oct 17. 70 (16):2048-90. [Medline]. Wendling P. AHA/ACC issue new performance, quality measures for MI. Medscape Medical News. Available at https://www.medscape.com/viewarticle/886075. September 22, 2017; Accessed: March 26, 2018. [Guideline] Ibanez B, James S, Agewall S, et al, for the ESC Scientific Document Group . 2017 ESC guidelines for the management of acute myocardial infarction in patients presenting with ST-segment elevation: The Task Force for the management of acute myocardial infarction in patients presenting with ST-segment elevation of the European Society of Cardiology (ESC). Eur Heart J. 2018 Jan 7. 39 (2):119-77. [Medline]. [Full Text]. Cabello JB, Burls A, Emparanza JI, Bayliss S, Quinn T. Oxygen therapy for acute myocardial infarction. Cochrane Database Syst Rev. 2013 Aug 21. 8:CD007160. [Medline]. Gislason GH, Jacobsen S, Rasmussen JN, et al. Risk of death or reinfarction associated with the use of selective cyclooxygenase-2 inhibitors and nonselective nonsteroidal antiinflammatory drugs after acute myocardial infarction. Circulation. 2006 Jun 27. 113 (25):2906-13. [Medline]. Luepker RV, Raczynski JM, Osganian S, et al. Effect of a community intervention on patient delay and emergency medical service use in acute coronary heart disease: The Rapid Early Action for Coronary Treatment (REACT) Trial. JAMA. 2000 Jul 5. 284 (1):60-7. [Medline]. De Luca G, Suryapranata H, Ottervanger JP, Antman EM. Time delay to treatment and mortality in primary angioplasty for acute myocardial infarction: every minute of delay counts. Circulation. 2004 Mar 16. 109 (10):1223-5. [Medline]. Armstrong PW, Westerhout CM, Welsh RC. Duration of symptoms is the key modulator of the choice of reperfusion for ST-elevation myocardial infarction. Circulation. 2009 Mar 10. 119 (9):1293-303. [Medline]. Bates ER, Nallamothu BK. Commentary: the role of percutaneous coronary intervention in ST-segment-elevation myocardial infarction. Circulation. 2008 Jul 29. 118 (5):567-73. [Medline]. Ellis SG, Armstrong P, Betriu A, et al, for the Facilitated Intervention with Enhanced Reperfusion Speed to Stop Events Investigators. Facilitated percutaneous coronary intervention versus primary percutaneous coronary intervention: design and rationale of the Facilitated Intervention with Enhanced Reperfusion Speed to Stop Events (FINESSE) trial. Am Heart J. 2004 Apr. 147 (4):E16. [Medline]. Andersen HR, Nielsen TT, Rasmussen K, et al, for the DANAMI-2 Investigators. A comparison of coronary angioplasty with fibrinolytic therapy in acute myocardial infarction. N Engl J Med. 2003 Aug 21. 349 (8):733-42. [Medline]. Widimsky P, Budesínsky T, Vorac D, et al, for the 'PRAGUE' Study Group Investigators. Long distance transport for primary angioplasty vs immediate thrombolysis in acute myocardial infarction. Final results of the randomized national multicentre trial--PRAGUE-2. Eur Heart J. 2003 Jan. 24 (1):94-104. [Medline]. Vaidya SR, Qamar A, Arora S, Devarapally SR, Kondur A, Kaul P. Culprit versus multivessel coronary intervention in ST-segment elevation myocardial infarction: a meta-analysis of randomized trials. Coron Artery Dis. 2018 Mar. 29 (2):151-60. [Medline]. Spitaleri G, Brugaletta S, Scalone G, et al. Role of ST-segment resolution in patients with ST-segment elevation myocardial infarction treated by primary percutaneous coronary intervention (from the 5-year outcomes of the EXAMINATION Trial) [in press]. Am J Cardiol. 7 Feb 2018. [Full Text]. Rencuzogullari I, Cagdas M, Karabag Y, et al. Association of the SYNTAX Score II with cardiac rupture in patients with ST-segment elevation myocardial infarction undergoing a primary percutaneous coronary intervention. Coron Artery Dis. 2018 Mar. 29 (2):97-103. [Medline]. Fibrinolytic Therapy Trialists' (FTT) Collaborative Group. Indications for fibrinolytic therapy in suspected acute myocardial infarction: collaborative overview of early mortality and major morbidity results from all randomised trials of more than 1000 patients. Lancet. 1994 Feb 5. 343 (8893):311-22. [Medline]. White HD. Thrombolytic therapy in the elderly. Lancet. 2000 Dec 16. 356 (9247):2028-30. [Medline]. Van de Werf F, Barron HV, Armstrong PW, et al, for the ASSENT-2 Investigators. Assessment of the Safety and Efficacy of a New Thrombolytic. Incidence and predictors of bleeding events after fibrinolytic therapy with fibrin-specific agents: a comparison of TNK-tPA and rt-PA. Eur Heart J. 2001 Dec. 22 (24):2253-61. [Medline]. Kodumuri V, Balasubramanian S, Vig A, et al. A meta-analysis comparing percutaneous coronary intervention with drug eluting stents versus coronary artery bypass grafting in unprotected left main disease [in press]. Am J Cardiol. 5 Feb 2018. [Full Text]. Yusuf S, Mehta SR, Chrolavicius S, et al, for the OASIS-6 Trial Group. Effects of fondaparinux on mortality and reinfarction in patients with acute ST-segment elevation myocardial infarction: the OASIS-6 randomized trial. JAMA. 2006 Apr 5. 295 (13):1519-30. [Medline]. Giraldez RR, Nicolau JC, Corbalan R, et al. Enoxaparin is superior to unfractionated heparin in patients with ST elevation myocardial infarction undergoing fibrinolysis regardless of the choice of lytic: an ExTRACT-TIMI 25 analysis. Eur Heart J. 2007 Jul. 28 (13):1566-73. [Medline]. Wallentin L, Goldstein P, Armstrong PW, et al. Efficacy and safety of tenecteplase in combination with the low-molecular-weight heparin enoxaparin or unfractionated heparin in the prehospital setting: the Assessment of the Safety and Efficacy of a New Thrombolytic Regimen (ASSENT)-3 PLUS randomized trial in acute myocardial infarction. Circulation. 2003 Jul 15. 108 (2):135-42. [Medline]. Assessment of the Safety and Efficacy of a New Thrombolytic Regimen (ASSENT)-3 Investigators. Efficacy and safety of tenecteplase in combination with enoxaparin, abciximab, or unfractionated heparin: the ASSENT-3 randomised trial in acute myocardial infarction. Lancet. 2001 Aug 25. 358 (9282):605-13. [Medline]. White H, Hirulog and Early Reperfusion or Occlusion (HERO)-2 Trial Investigators. Thrombin-specific anticoagulation with bivalirudin versus heparin in patients receiving fibrinolytic therapy for acute myocardial infarction: the HERO-2 randomised trial. Lancet. 2001 Dec 1. 358 (9296):1855-63. [Medline]. Tcheng JE, Mackay SM. Prasugrel versus clopidogrel antiplatelet therapy after acute coronary syndrome: matching treatments with patients. Am J Cardiovasc Drugs. 2012 Apr 1. 12 (2):83-91. [Medline]. Schnapf AJ. Prasugrel versus clopidogrel: new management strategies for acute coronary syndrome. J Cardiovasc Nurs. 2013 Sep-Oct. 28 (5):483-94. [Medline]. Berger JS, Sallum RH, Katona B, et al. Is there an association between aspirin dosing and cardiac and bleeding events after treatment of acute coronary syndrome? A systematic review of the literature. Am Heart J. 2012 Aug. 164 (2):153-162.e5. [Medline]. CURRENT-OASIS 7 Investigators, Mehta SR, Bassand JP, Chrolavicius S, et al. Dose comparisons of clopidogrel and aspirin in acute coronary syndromes. N Engl J Med. 2010 Sep 2. 363 (10):930-42. [Medline]. CAPRIE Steering Committee. A randomised, blinded, trial of clopidogrel versus aspirin in patients at risk of ischaemic events (CAPRIE). CAPRIE Steering Committee. Lancet. 1996 Nov 16. 348 (9038):1329-39. [Medline]. Wallentin L, Becker RC, Budaj A,et al, for the PLATO Investigators. Ticagrelor versus clopidogrel in patients with acute coronary syndromes. N Engl J Med. 2009 Sep 10. 361 (11):1045-57. [Medline]. Storey RF, Becker RC, Harrington RA, et al. Characterization of dyspnoea in PLATO study patients treated with ticagrelor or clopidogrel and its association with clinical outcomes. Eur Heart J. 2011 Dec. 32 (23):2945-53. [Medline]. The PURSUIT Trial Investigators. Inhibition of platelet glycoprotein IIb/IIIa with eptifibatide in patients with acute coronary syndromes. Platelet Glycoprotein IIb/IIIa in Unstable Angina: Receptor Suppression Using Integrilin Therapy. N Engl J Med. 1998 Aug 13. 339 (7):436-43. [Medline]. Gibson CM, Goel M, Cohen DJ, et al. Six-month angiographic and clinical follow-up of patients prospectively randomized to receive either tirofiban or placebo during angioplasty in the RESTORE trial. Randomized Efficacy Study of Tirofiban for Outcomes and Restenosis. J Am Coll Cardiol. 1998 Jul. 32 (1):28-34. [Medline]. Goodman SG, Cohen M, Bigonzi F, et al. Randomized trial of low molecular weight heparin (enoxaparin) versus unfractionated heparin for unstable coronary artery disease: one-year results of the ESSENCE Study. Efficacy and Safety of Subcutaneous Enoxaparin in Non-Q Wave Coronary Events. J Am Coll Cardiol. 2000 Sep. 36 (3):693-8. [Medline]. Petersen JL, Mahaffey KW, Hasselblad V, et al. Efficacy and bleeding complications among patients randomized to enoxaparin or unfractionated heparin for antithrombin therapy in non-ST-Segment elevation acute coronary syndromes: a systematic overview. JAMA. 2004 Jul 7. 292 (1):89-96. [Medline]. White HD, Kleiman NS, Mahaffey KW, et al. Efficacy and safety of enoxaparin compared with unfractionated heparin in high-risk patients with non-ST-segment elevation acute coronary syndrome undergoing percutaneous coronary intervention in the Superior Yield of the New Strategy of Enoxaparin, Revascularization and Glycoprotein IIb/IIIa Inhibitors (SYNERGY) trial. Am Heart J. 2006 Dec. 152 (6):1042-50. [Medline]. Stone GW, McLaurin BT, Cox DA, et al, for the ACUITY Investigators. Bivalirudin for patients with acute coronary syndromes. N Engl J Med. 2006 Nov 23. 355 (21):2203-16. [Medline]. Goto K, Lansky AJ, Fahy M, et al. Predictors of outcomes in medically treated patients with acute coronary syndromes after angiographic triage: an Acute Catheterization And Urgent Intervention Triage Strategy (ACUITY) substudy. Circulation. 2010 Feb 23. 121 (7):853-62. [Medline]. FUTURA/OASIS-8 Trial Group, Steg PG, Jolly SS, Mehta SR, et al. Low-dose vs standard-dose unfractionated heparin for percutaneous coronary intervention in acute coronary syndromes treated with fondaparinux: the FUTURA/OASIS-8 randomized trial. JAMA. 2010 Sep 22. 304 (12):1339-49. [Medline]. Jolly SS, Faxon DP, Fox KA, et al. Efficacy and safety of fondaparinux versus enoxaparin in patients with acute coronary syndromes treated with glycoprotein IIb/IIIa inhibitors or thienopyridines: results from the OASIS 5 (Fifth Organization to Assess Strategies in Ischemic Syndromes) trial. J Am Coll Cardiol. 2009 Jul 28. 54 (5):468-76. [Medline]. Garg R, Yusuf S. Overview of randomized trials of angiotensin-converting enzyme inhibitors on mortality and morbidity in patients with heart failure. Collaborative Group on ACE Inhibitor Trials. JAMA. 1995 May 10. 273 (18):1450-6. [Medline]. Yusuf S, Sleight P, Pogue J, Bosch J, Davies R, Dagenais G. Effects of an angiotensin-converting-enzyme inhibitor, ramipril, on cardiovascular events in high-risk patients. The Heart Outcomes Prevention Evaluation Study Investigators. N Engl J Med. 2000 Jan 20. 342 (3):145-53. [Medline]. ONTARGET Investigators, Yusuf S, Teo KK, Pogue J, et al. Telmisartan, ramipril, or both in patients at high risk for vascular events. N Engl J Med. 2008 Apr 10. 358 (15):1547-59. [Medline]. Pitt B, Remme W, Zannad F, et al, for the Eplerenone Post-Acute Myocardial Infarction Heart Failure Efficacy and Survival Study Investigators. Eplerenone, a selective aldosterone blocker, in patients with left ventricular dysfunction after myocardial infarction. N Engl J Med. 2003 Apr 3. 348 (14):1309-21. [Medline]. Lopez-Jimenez F, Simha V, Thomas RJ, et al. A summary and critical assessment of the 2013 ACC/AHA guideline on the treatment of blood cholesterol to reduce atherosclerotic cardiovascular disease risk in adults: filling the gaps. Mayo Clin Proc. 2014 Sep. 89 (9):1257-78. [Medline]. Schwartz GG, Olsson AG, Ezekowitz MD, Ganz P, Oliver MF, Waters D, et al. Effects of atorvastatin on early recurrent ischemic events in acute coronary syndromes: the MIRACL study: a randomized controlled trial. JAMA. 2001 Apr 4. 285(13):1711-8. [Medline]. Patti G, Barczi G, Orlic D, et al. Outcome comparison of 600- and 300-mg loading doses of clopidogrel in patients undergoing primary percutaneous coronary intervention for ST-segment elevation myocardial infarction: results from the ARMYDA-6 MI (Antiplatelet therapy for Reduction of MYocardial Damage during Angioplasty-Myocardial Infarction) randomized study. J Am Coll Cardiol. 2011 Oct 4. 58 (15):1592-9. [Medline]. [Guideline] Eckel RH, Jakicic JM, Ard JD, et al. American College of Cardiology/American Heart Association Task Force on Practice Guidelines. 2013 AHA/ACC guideline on lifestyle management to reduce cardiovascular risk: a report of the American College of Cardiology/American Heart Association Task Force on Practice Guidelines. Circulation. 2014 Jun 24. 129 (25 Suppl 2):S76-99. [Medline]. [Full Text]. Gaudiani VA, Miller DG, Stinson EB, Oyer PE, Reitz BA, Moreno-Cabral RJ, et al. Postinfarction ventricular septal defect: an argument for early operation. Surgery. 1981 Jan. 89(1):48-55. [Medline]. Daggett WM, Buckley MJ, Akins CW, Leinbach RC, Gold HK, Block PC, et al. Improved results of surgical management of postinfarction ventricular septal rupture. Ann Surg. 1982 Sep. 196(3):269-77. [Medline]. [Full Text]. Fish KM, Ishikawa K, Hajjar RJ. Stem cell therapy for acute myocardial infarction: on the horizon or still a dream?. Coron Artery Dis. 2018 Mar. 29 (2):89-91. [Medline]. Schachinger V, Erbs S, Elsasser A, et al, for the REPAIR-AMI Investigators. Intracoronary bone marrow-derived progenitor cells in acute myocardial infarction. N Engl J Med. 2006 Sep 21. 355 (12):1210-21. [Medline]. Traverse JH, Henry TD, Ellis SG, et al. Effect of intracoronary delivery of autologous bone marrow mononuclear cells 2 to 3 weeks following acute myocardial infarction on left ventricular function: the LateTIME randomized trial. JAMA. 2011 Nov 16. 306(19):2110-9. [Medline]. [Guideline] Windecker S, Kolh P, Alfonso F, et al. 2014 ESC/EACTS Guidelines on myocardial revascularization: The Task Force on Myocardial Revascularization of the European Society of Cardiology (ESC) and the European Association for Cardio-Thoracic Surgery (EACTS)Developed with the special contribution of the European Association of Percutaneous Cardiovascular Interventions (EAPCI). Eur Heart J. 2014 Oct 1. 35 (37):2541-619. [Medline]. [Full Text]. [Guideline] Levine GN, Bates ER, Blankenship JC, et al. 2015 ACC/AHA/SCAI focused update on primary percutaneous coronary intervention for patients with ST-elevation myocardial infarction: an update of the 2011 ACCF/AHA/SCAI guideline for percutaneous coronary intervention and the 2013 ACCF/AHA guideline for the management of ST-elevation myocardial infarction: a report of the American College of Cardiology/American Heart Association Task Force on Clinical Practice Guidelines and the Society for Cardiovascular Angiography and Interventions. Circulation. 2016 Mar 15. 133 (11):1135-47. [Medline]. [Full Text]. [Guideline] Levine GN, Bates ER, Blankenship JC, et al. 2011 ACCF/AHA/SCAI guideline for percutaneous coronary intervention: a report of the American College of Cardiology Foundation/American Heart Association Task Force on Practice Guidelines and the Society for Cardiovascular Angiography and Interventions. Circulation. 2011 Dec 6. 124 (23):e574-651. [Medline]. [Full Text]. [Guideline] Hillis LD, Smith PK, Anderson JL, et al. 2011 ACCF/AHA guideline for coronary artery bypass graft surgery: a report of the American College of Cardiology Foundation/American Heart Association Task Force on Practice Guidelines. Circulation. 2011 Dec 6. 124 (23):e652-735. [Medline]. [Full Text]. [Guideline] Kulik A, Ruel M, Jneid H, et al, for the American Heart Association Council on Cardiovascular Surgery and Anesthesia. Secondary prevention after coronary artery bypass graft surgery: a scientific statement from the American Heart Association. Circulation. 2015 Mar 10. 131 (10):927-64. [Medline]. [Full Text]. [Guideline] Levine GN, Bates ER, Bittl JA, et al. 2016 ACC/AHA guideline focused update on duration of dual antiplatelet therapy in patients with coronary artery disease: a report of the American College of Cardiology/American Heart Association Task Force on Clinical Practice Guidelines: an update of the 2011 ACCF/AHA/SCAI guideline for percutaneous coronary intervention, 2011 ACCF/AHA guideline for coronary artery bypass graft surgery, 2012 ACC/AHA/ACP/AATS/PCNA/SCAI/STS guideline for the diagnosis and management of patients with stable isc... Circulation. 2016 Sep 6. 134 (10):e123-55. [Medline]. [Full Text]. Modi KA, Nylk TM, Sheridan FM. Medical management of acute ST elevation myocardial infarction. J La State Med Soc. 2001 Jun. 153(6):284-90. [Medline]. Ohman EM, Harrington RA, Cannon CP, Agnelli G, Cairns JA, Kennedy JW. Intravenous thrombolysis in acute myocardial infarction. Chest. 2001 Jan. 119(1 Suppl):253S-277S. [Medline]. Ferencik M. High-risk coronary plaque predicts acute coronary syndrome independently of >50% coronary stenosis and cardiovascular risk factors in patients with acute chest pain: results from ROMICAT II trial (abstract 109). Presented at: Society of Cardiovascular Computed Tomography 2014 Annual Scientific Meeting; July 11, 2014; San Diego, California. Busko M. High-risk plaque predicts ACS in ER patients with chest pain. Heartwire. July 18, 2014. [Full Text]. Diaz-Zamudio M. Quantitative plaque burden from coronary CT angiography noninvasively predict lesion-specific ischemia in intermediate coronary lesions (abstract 231). Presented at: Society of Cardiovascular Computed Tomography 2014 Annual Scientific Meeting; July 12, 2014; San Diego, California. Than M, Cullen L, Reid CM, Lim SH, et al. A 2-h diagnostic protocol to assess patients with chest pain symptoms in the Asia-Pacific region (ASPECT): a prospective observational validation study. Lancet. 2011 Mar 26. 377 (9771):1077-84. [Medline]. Innocenti F, Lazzeretti D, Conti A, Zanobetti M, Vicidomini S, Pini R. Stress echocardiography in the ED: diagnostic performance in high-risk subgroups. Am J Emerg Med. 2013 Jul 1. [Medline]. Boggs W. Stress Echo Rules out Myocardial Ischemia in the ED. Medscape [serial online]. Available at http://www.medscape.com/viewarticle/808919. Accessed: August 12, 2013. Terkelsen CJ, Sorensen JT, Maeng M, et al. System delay and mortality among patients with STEMI treated with primary percutaneous coronary intervention. JAMA. 2010 Aug 18. 304 (7):763-71. [Medline]. Jeffrey S. AVOID Oxygen? Evidence of Harm in MI. Medscape. Nov 21 2014. [Full Text]. Nainggolan L. New US STEMI Guidelines Are More User Friendly. Medscape News Dec 18, 2012. Available at http://www.medscape.com/viewarticle/776325. Accessed: February 6, 2013. Niccoli G, Rigattieri S, De Vita MR, et al. Open-label, randomized, placebo-controlled evaluation of intracoronary adenosine or nitroprusside after thrombus aspiration during primary percutaneous coronary intervention for the prevention of microvascular obstruction in acute myocardial infarction: the REOPEN-AMI study (Intracoronary Nitroprusside Versus Adenosine in Acute Myocardial Infarction). JACC Cardiovasc Interv. 2013 Jun. 6 (6):580-9. [Medline]. Montalescot G, Zeymer U, Silvain J, et al. Intravenous enoxaparin or unfractionated heparin in primary percutaneous coronary intervention for ST-elevation myocardial infarction: the international randomised open-label ATOLL trial. Lancet. 2011 Aug 20. 378(9792):693-703. [Medline]. Stone GW, Witzenbichler B, Guagliumi G, et al. Heparin plus a glycoprotein IIb/IIIa inhibitor versus bivalirudin monotherapy and paclitaxel-eluting stents versus bare-metal stents in acute myocardial infarction (HORIZONS-AMI): final 3-year results from a multicentre, randomised controlled trial. Lancet. 2011 Jun 25. 377(9784):2193-204. [Medline]. Charlot M, Grove EL, Hansen PR, et al. Proton pump inhibitor use and risk of adverse cardiovascular events in aspirin treated patients with first time myocardial infarction: nationwide propensity score matched study. BMJ. 2011 May 11. 342:d2690. [Medline]. [Full Text]. AstraZeneca. US FDA approves expanded indication for BRILINTA to include long-term use in patients with a history of heart attack [news release]. Available at http://www.astrazeneca.com/Media/Press-releases/Article/20150903. September 3, 2015; Accessed: September 15, 2015. Bonaca MP, Bhatt DL, Cohen M, Steg PG, Storey RF, Jensen EC, et al. Long-term use of ticagrelor in patients with prior myocardial infarction. N Engl J Med. 2015 May 7. 372 (19):1791-800. [Medline]. Cuzick J, Thorat MA, Bosetti C, et al. Estimates of benefits and harms of prophylactic use of aspirin in the general population. Ann Oncol. 2014 Aug 5. [Medline]. Bankhead C. Benefits add up for regular aspirin use. MedPage Today. August 5, 2014. [Full Text]. Stiles S. L-Carnitine Retakes Spotlight, Hints at Survival Benefit in Acute MI: Meta-analysis. Medscape Medical News. Available at http://www.medscape.com/viewarticle/782488. Accessed: May 2, 2013. DiNicolantonio JJ, Lavie CJ, Fares H, Menezes AR, O'Keefe JH. L-carnitine in the secondary prevention of cardiovascular disease: systematic review and meta-analysis. Mayo Clin Proc. 2013 Jun. 88 (6):544-51. [Medline]. Reuters Health Information. Prophylactic Lidocaine for Out-of-Hospital Cardiac Arrest Seen Helpful. Medscape [serial online]. Available at http://www.medscape.com/viewarticle/805805. Accessed: June 30, 2013. Kudenchuk PJ, Newell C, White L, Fahrenbruch C, Rea T, Eisenberg M. Prophylactic lidocaine for post resuscitation care of patients with out-of-hospital ventricular fibrillation cardiac arrest. Resuscitation. 2013 Jun 3. [Medline]. Boggs W. Aspiration thrombectomy may improve angioplasty after acute MI. Medscape Medical News. May 13, 2013. [Full Text]. Kumbhani DJ, Bavry AA, Desai MY, Bangalore S, Bhatt DL. Role of aspiration and mechanical thrombectomy in patients with acute myocardial infarction undergoing primary angioplasty: An updated meta-analysis of randomized trials. J Am Coll Cardiol. 2013 May 8. [Medline]. Zaman S, Narayan A, Thiagalingam A, et al. Long-term arrhythmia-free survival in patients with severe left ventricular dysfunction and no inducible ventricular tachycardia post myocardial infarction. Circulation. 2013 Dec 31. [Medline]. O'Riordan M. Positive EP test helps ID post-MI patients for ICDs. Heartwire. January 2, 2014. [Full Text]. Wood S. FDA Review Finds No Increased Risk of MI With Dabigatran (Pradaxa). Medscape Medical News. Available at http://www.medscape.com/viewarticle/825080. Accessed: May 27, 2014. FDA. FDA study of Medicare patients finds risks lower for stroke and death but higher for gastrointestinal bleeding with Pradaxa (dabigatran) compared to warfarin. Available at http://www.fda.gov/Drugs/DrugSafety/ucm396470.htm. Accessed: May 27, 2014. O'Riordan M. A shot in arm, a boost for the heart: flu vaccination reduces AMI risk. Medscape Medical News. August 26, 2013. [Full Text]. Rao KK, Enriquez JR, de Lemos JA, Alexander KP, Chen AY, McGuire DK, et al. Use of aldosterone antagonists at discharge after myocardial infarction: Results from the National Cardiovascular Data Registry Acute Coronary Treatment and Intervention Outcomes Network (ACTION) Registry-Get with the Guidelines (GWTG). Am Heart J. 2013 Oct. 166(4):709-715. [Medline]. Stiles, S. Even With CKD, Warfarin Safely Cuts Events in AF After MI, Study Finds. Medscape Medical News. Available at http://www.medscape.com/viewarticle/821444. Accessed: March 12, 2014. Carrero JJ, Evans M, Szummer K, Spaak J, Lindhagen L, Edfors R, et al. Warfarin, kidney dysfunction, and outcomes following acute myocardial infarction in patients with atrial fibrillation. JAMA. 2014 Mar 5. 311(9):919-28. [Medline]. FDA approves Zontivity to reduce the risk of heart attacks and stroke in high-risk patients. US Food and Drug Administration. Available at http://www.fda.gov/NewsEvents/Newsroom/PressAnnouncements/ucm396585.htm. Accessed: May 12, 2014. Finkle WD, Greenland S, Ridgeway GK, et al. Increased risk of non-fatal myocardial infarction following testosterone therapy prescription in men. PLoS One. 2014. 9(1):e85805. [Medline]. [Full Text]. O'Riordan M. Another study links testosterone therapy to MI risk. Heartwire. January 30, 2014. [Full Text]. Quinn T, Johnsen S, Gale CP, Snooks H, McLean S, Woollard M, et al. Effects of prehospital 12-lead ECG on processes of care and mortality in acute coronary syndrome: a linked cohort study from the Myocardial Ischaemia National Audit Project. Heart. 2014 Apr 14. [Medline]. Stiles S. Prehospital ECG Cuts Mortality in STEMI and NSTEMI: UK Study. Medscape Medical News. Available at http://www.medscape.com/viewarticle/823754. Accessed: April 19, 2014. Chughtai H, Ratner D, Pozo M, et al. Prehospital delay and its impact on time to treatment in ST-elevation myocardial infarction. Am J Emerg Med. 2011 May. 29 (4):396-400. [Medline]. Xiang L, Zhong A, You T, Chen J, Xu W, Shi M. Prognostic significance of right bundle branch block for patients with acute myocardial infarction: a systematic review and meta-analysis. Med Sci Monit. 2016 Mar 27. 22:998-1004. [Medline]. Kim KH, Jeon KN, Kang MG, et al. Prognostic value of computed tomographic coronary angiography and exercise electrocardiography for cardiovascular events. Korean J Intern Med. 2016 Mar 25. [Medline]. Hussain MA, Bin-Ayeed SA, Saeed OQ, Verma S, Al-Omran M. Impact of diabetes on carotid artery revascularization. J Vasc Surg. 2016 Apr. 63 (4):1099-1107.e4. [Medline]. Stetler J, Karatasakis A, Christakopoulos GE, et al. Impact of crossing technique on the incidence of periprocedural myocardial infarction during chronic total occlusion percutaneous coronary intervention. Catheter Cardiovasc Interv. 2016 Jul. 88 (1):1-6. [Medline]. Mizuno S, Kunisawa S, Sasaki N, Fushimi K, Imanaka Y. Effects of night-time and weekend admissions on in-hospital mortality in acute myocardial infarction patients in Japan. PLoS One. 2018. 13 (1):e0191460. [Medline]. [Full Text]. Brooks M. FDA approves evolocumab (Repatha) to prevent CV events. Medscape Medical News. Available at https://www.medscape.com/viewarticle/889513. December 1, 2017; Accessed: December 7., 2017. A 53-year-old patient who had experienced 3 hours of chest pain had a 12-lead electrocardiogram performed, and the results are as shown. He was given sublingual nitroglycerin and developed severe symptomatic hypotension. His blood pressure normalized with volume resuscitation. The right-sided leads indicate ST-segment elevations in RV<inf>3</inf> to RV<inf>5</inf>, which are consistent with a right ventricular infarct. Modified 2-dimensional (top) echocardiogram and color flow Doppler image (bottom). Apical 4-chamber views show a breach in the interventricular septum and free communication between ventricles through a large apical septum ventricular septal defect in a patient who recently had an anterior myocardial infarction. Apical 2-chamber view depicts a large left ventricular apical thrombus with mobile extensions. Parasternal long-axis view of the left ventricle demonstrates a large inferobasal aneurysm. Note the wide neck and base of the aneurysm. Early healed myocardial infarction, anterior septum. 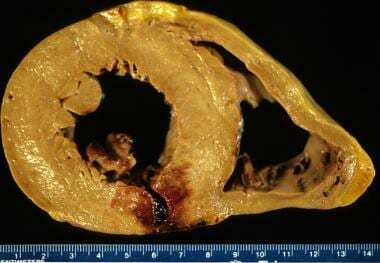 There is a glistening gelatinous appearance to this infarction, which occurred 6 weeks prior to death, from embolization during valve surgery. Table 2. Fibrinolytic Agents Used in Management of STEMI. CPR = cardiopulmonary resuscitation; INR = international normalized ratio; STEMI = ST-elevation myocardial infarction; US = United States of America. Bolus 15 mg followed by infusion 0.75 mg/kg for 30 min (maximum 50 mg), then 0.5 mg/kg (maximum 35 mg) over the next 60 min; total dose not to exceed 100 mg.
IV = intravenous; rPA = recombinant human tissue plasminogen activator; STEMI = ST-elevation myocardial infarction; tPA = tissue plasminogen activator; US = United States of America.